Compilation of Feedback Report Part B has commenced. Design refinements have been taken into consideration and local simulations took place at TAG Farnborough Airport. Further local simulations to be carried out at TAG Farnborough Airport. Further workshop sessions with key aviation stakeholders to take place to discuss feedback as well as clarity on design and operational issues. TAG Farnborough Airport plans to publish a second document, Feedback Report Part B, which will provide a detailed analysis of the responses received, including design implications. This is expected to be published in Summer 2015. TAG Farnborough Airport has been awarded ‘Best Handling Agent/FBO’ at the Baltic Air Charter Association (BACA) Awards 2014. 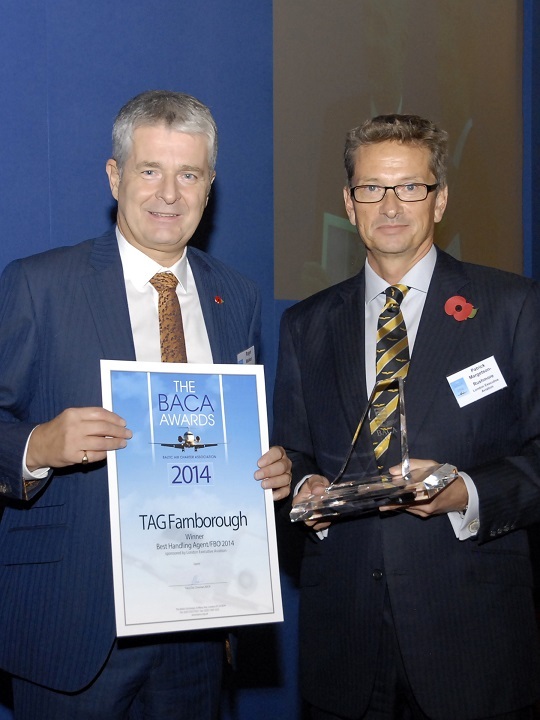 Roger Walker (left), Director Airport Operations at TAG Farnborough Airport, was presented with the award by Patrick Margetson-Rushmore, CEO of London Executive Aviation, the sponsor of this category, at the BACA 2014 Autumn Lunch & Excellence Awards at London’s Guildhall on 30 October 2014. Analysis of feedback gathered during the public consultation period has continued. A number of workshop sessions with key stakeholders have taken place to discuss feedback and possible design refinements. Analysis of feedback gathered during the public consultation period continues. Further workshop sessions with key stakeholders are being planned. On 29 August 2014, TAG Farnborough Airport published an initial document, Feedback Report Part A, which provides a summary analysis of the numbers and types of responses received. The document is available on the dedicated website www.consultation.tagfarnborough.com and printed copies of the document have been posted to stakeholders upon request. A number of workshop sessions with key stakeholders are being planned to discuss feedback and possible design refinements. TAG Farnborough Airport plans to publish a second document, Feedback Report Part B, which will provide a more detailed analysis of the responses received, including design implications. This is expected to be published in Summer 2015. On 29 August 2014, TAG Farnborough Airport published an initial document, Feedback Report Part A, which provides a summary analysis of the numbers and types of responses received.